How do I commission a piece for my home or business? Can I talk to or email the artist directly? Please go to the section on our website that says Artist’s Bio & take a look! Where is the art located for purchase? Our working studio is in Louisville Kentucky. You may purchase any piece from the website directly from our website. Please contact Tony if you are interested in purchasing. If the piece views as sold, remember Viscardi can recreate a piece for you . Art pieces are located at Regalo Gallery in Louisville, KY. and Arts of the Ohio in Jeffersonville, In. for purchase. Do you have any shows in our area? We will travel to shows in Chicago, St. Louis, cities in Florida and Michigan during 2012. Visit us in Louisville at the St. James Court Art Show every first weekend of Oct. The easiest way to find out updated show information is to sign up for our mailing list. Why are similar sculptures more expensive than others? Any pieces with neon will cost more than pieces without. 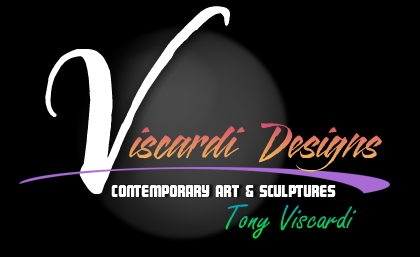 Neon is harder to incorporate into the art but it is also Viscardi's passion. Neon incorporated into the art is a talent in itself. Can a piece with neon be created without the neon? Yes, contact Viscardi for specific questions. How do I “care” for my art pieces? What do I do if I want to commission an art piece? Call Tony directly at 502-419-6755. Contact us for other information and additional questions. How do I pay for a piece I wish to purchase or commission?